The medieval town of King’s Lynn exists today. On narrow streets along the edge of a river named Great Ouse, buildings dating from the 12th century through Georgian times proudly serve as homes and offices. An 12th century minster (a cathedral-like church shown above) anchors one end of town while the site of the ancient fair granted by a long-ago king is at the other. Shakespeare played here! The 15th century theatre, one of the oldest in Great Britain. A nearly 600-year-old theatre where it’s believed Shakespeare and his band of actors once worked is still active. Lovingly restored homes, inhabited by proud citizens of the town, bear plaques attesting to the century in which they were built. During the Middle Ages King’s Lynn was an important port city. Sifting sands moved the river, taking business and money away, and leaving the town in its original state. Today visitors can walk on the quays along the river and on the streets through original town, past relics of centuries past. Originally a guild hall, today this 15th century building is the city hall. The “checkerboard” facade was created by alternating white stones with black. 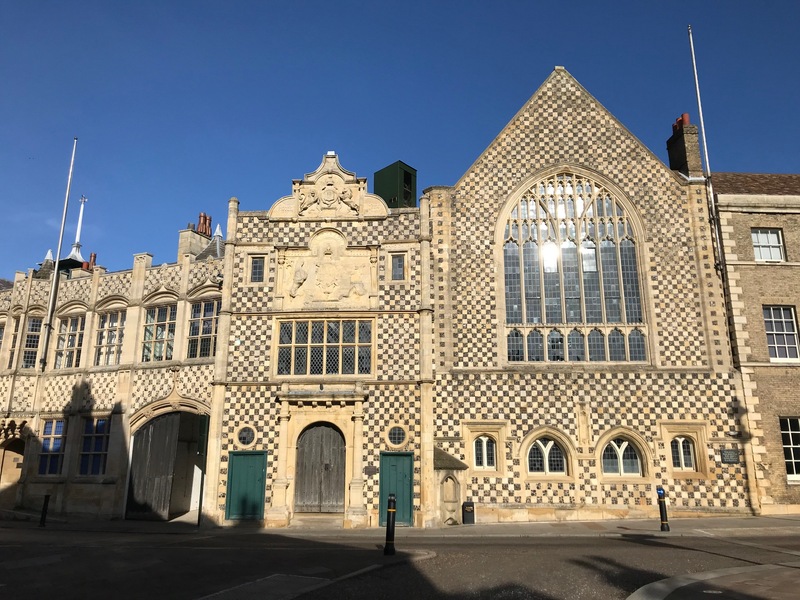 One of the oldest and most important buildings is the town hall, built originally about 1400 by a guild of wealthy ship owners and merchants. The building was constructed one century at a time, but the checkerboard façade of white stone and shale keeps that a secret. Just across the narrow street stands the “minster.” A great church honoring Saint Margaret was built here beginning about 1100 AD. It would be a cathedral in another country. Extraordinarily long, the east end of the church is graced by a large stained glass window with a huge carved Tree of Jesse below it. A 20th century stained glass masterpiece can be seen on the western end. The other very impressive old church in King’s Lynn is St. Nicolas, built in the 1500s by the the town’s rich merchants and shippers. Another church, Saint Nicolas chapel, is at the opposite end of the mile-long center of town. Built during the renaissance by and for the many wealthy ship owners, traders and merchants, this church now only serves its original purpose on Christmas and other special occasions. The hammer-beam roof is graced by a large winged angel attached between each pair of roof trusses. The floor is paved in memorial stones and polished stone 17th century sculptures memorialize entire families. In a corner of St. Margaret’s: an old tree, some very old gravesstones and the buildings of the 12th century priory. A priory, just south of the minster, dates from the early 1100s. 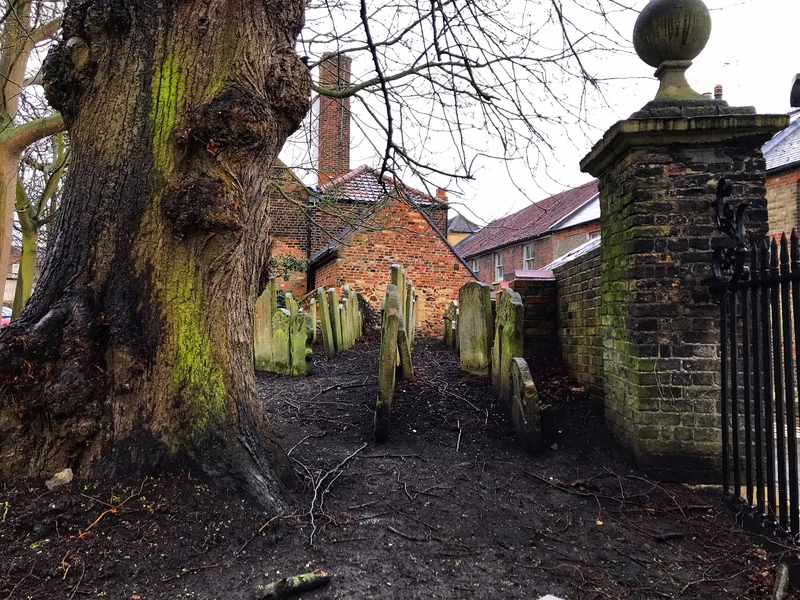 Today the row of ancient 2-story buildings where monks once lived advjacent to St. Margaret’s church are small homes sharing a secret garden. 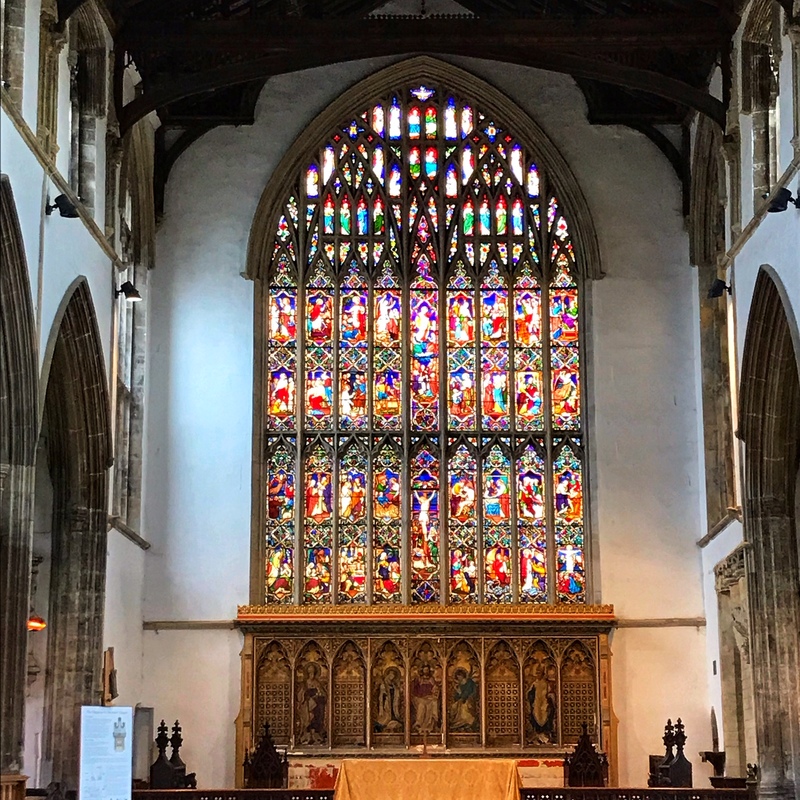 Medieval windows and walls built of a jumble of stone and bricks overlook the minster church. Buillt in sections between 1350 and the early 1600s, Hampton Court is comprised of four connected former warehouses than now house large homes. Remnant of an old monastery, the Red Tower is now the centerpiece of “The Walks,” the town’s large, central 18th century park. All over the town buildings that are centuries old have become gracious homes and offices. 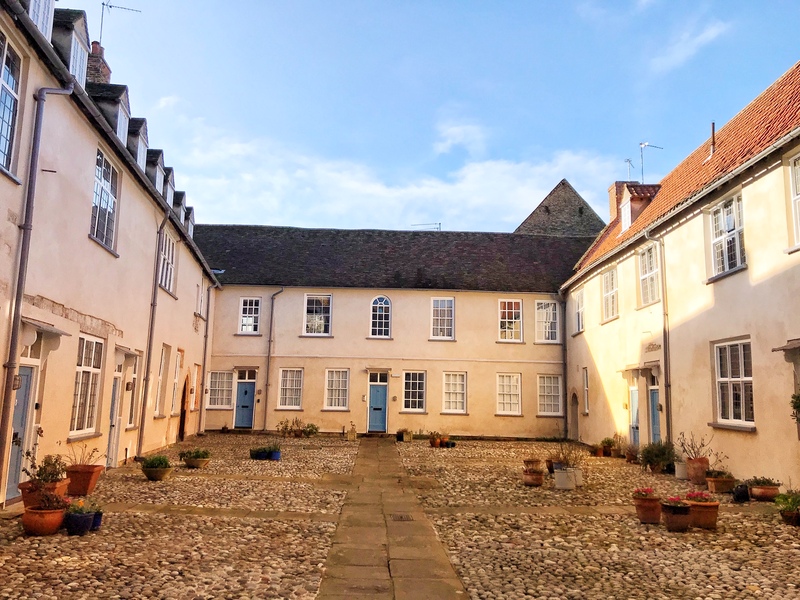 One such is Hampton Court, a large connected group of 14th and 15th century warehouses rescued by citizens of King’s Lynn and converted into 15 gracious townhouses. The streets near the river’s edge are the oldest in town. Many Georgian-era fine brick homes are seen on the city’s streets interposed with older homes, some of them medieval. A large park forms the center of the city. Designed for exercising the upper class in the 18th century, today it’s perfect for walkers and runners. In “The Walks” as the park is known, the visitor finds the remains of a city gate and a small part of the old city walls. 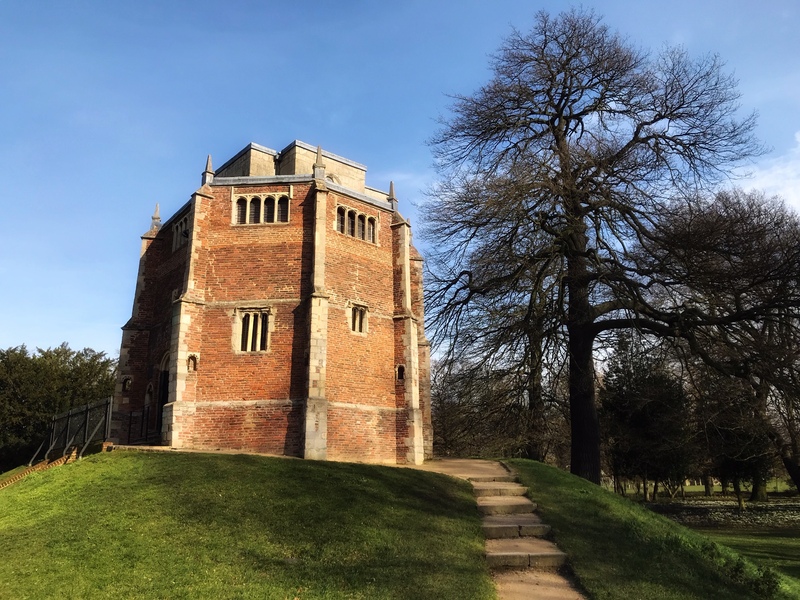 In the center of the park a small, squat tower on a gentle rise named the “Red Mount Tower,” built in the 1483 and restored recently is open to visitors. 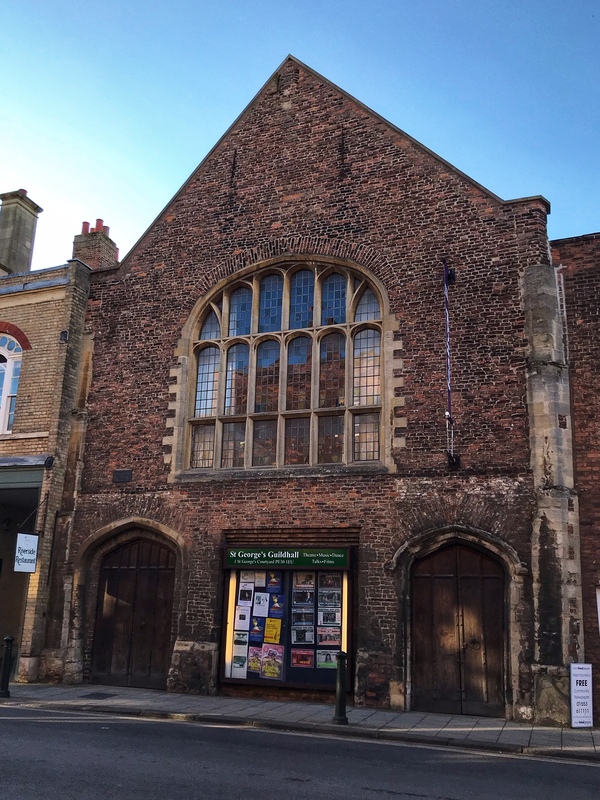 Nearby a Victorian library and a church built to “seat everyone” (unlike the other churches in the city which sold seating) represent community life in King’s Lynn in the 19th century as do terraces of large and small brick homes. A view of the “”High Street” shopping district in King’s Lynn. 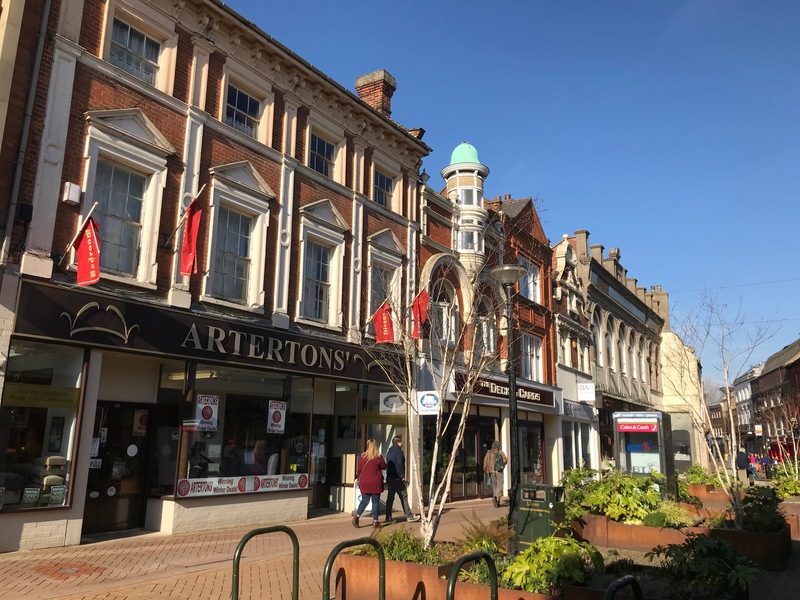 King’s Lynn’s traditional “High Street” shopping area is comprised of several blocks of popular retail shops as well as antique stores and theatres. Two Sunday morning joggers pass by the charming Duke’s Head Hotel. Continue the “historical” ambience of time spent in King’s Lynn at one of several long-serving hotels which are still active here. 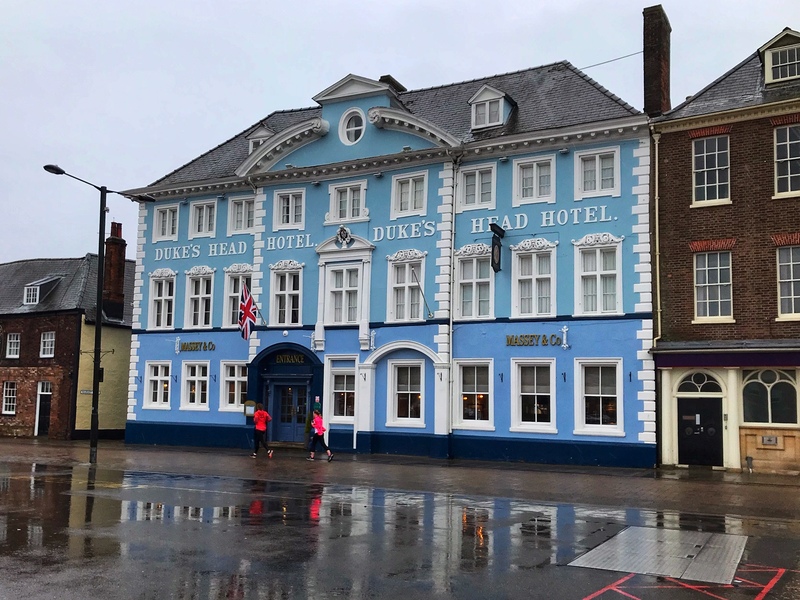 The Duke’s Head hotel, overlooking the ancient marketplace, is a lovely shade of blue. Near it, the Globe Hotel is also a long-time favorite. The Bank House is a fine hotel near the Custom House and the river. All these hotels have traditional English restaurants. Other fine dining establishments are found throughout the old town. On river’s edge, Marriott Warehouse is a wine bar and popular restaurant – try their Sunday lunch! Hotels and restaurants to fit all budgets are plentiful in King’s Lynn. 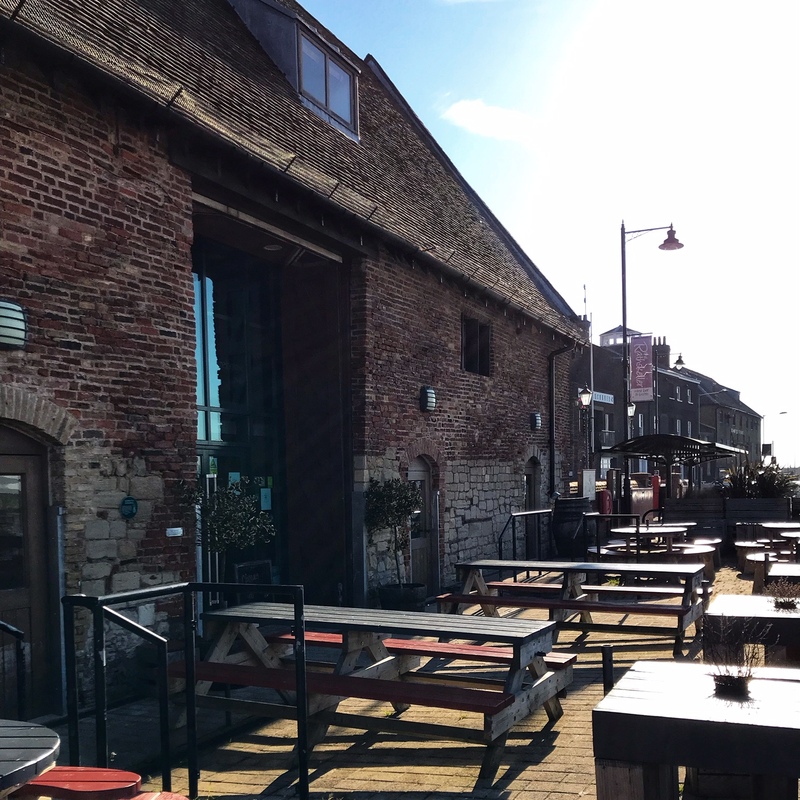 A repurposed old warehouse on the quay is a fine restaurant and summer eating space now. 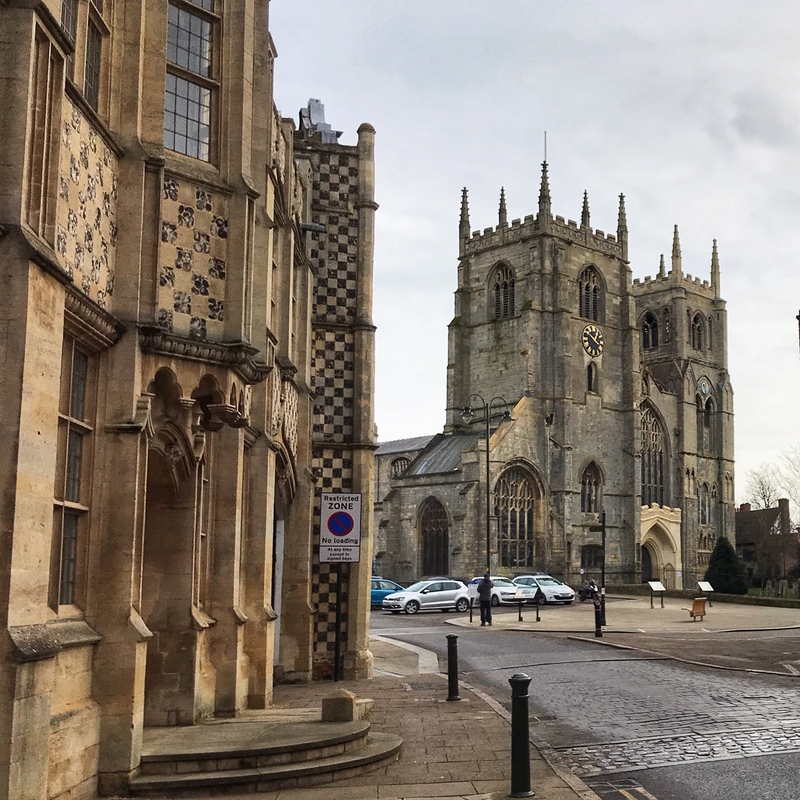 To discover a town that proudly protects and enjoys its history, add this lovely small city to your next U.K. itinerary. This entry was posted in England by Libbie Griffin. Bookmark the permalink. You are in my neck of the woods now! 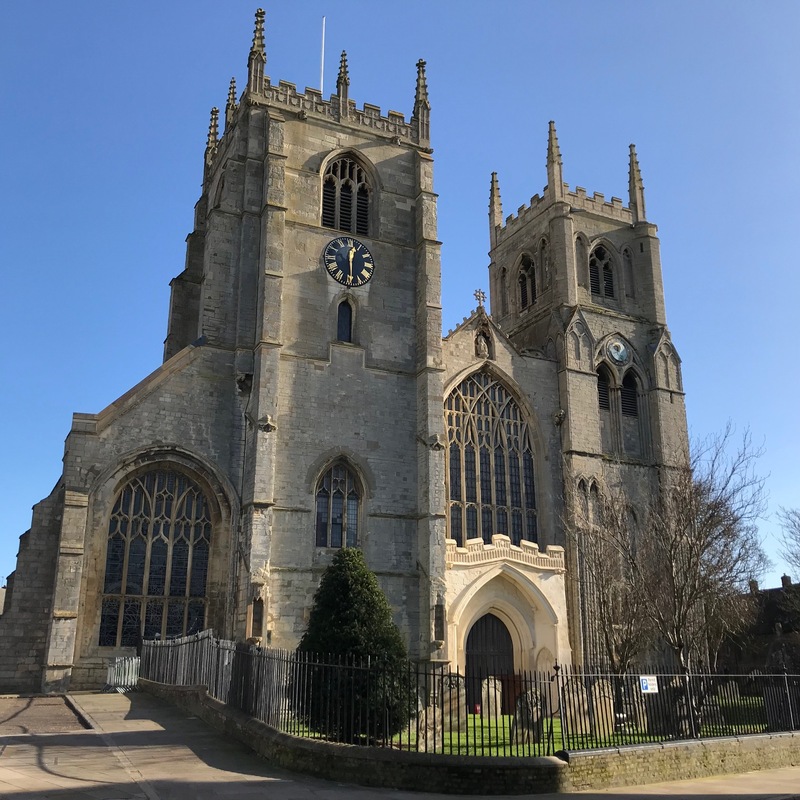 Hi friend – I enjoyed Essex, what a gorgeous cathedral, but after reading your post I am wishing I had gone to King’s Lynn – it looks so interesting. When I clicked on your link in the Liberal Ladies message it took me to Spectrum-Time Warner. Took me a while to realize you are in-my-suitcase – not in.my.suitcase. Anyway glad to see some posts from England and presume your trip is going well.